The source of epithelium probably is the epithelial cell rests in the periodontium of the buccal bifurcation of mandibular molars..
A common sign is the lack of or a delay in eruption of a mandibular first or second molar. Lingual cusp tips may be abnormally protruding through the mucosa, higher than the position of the buccal cusps. The teeth are always vital. It is always located in the buccal furcation of the affected molar . 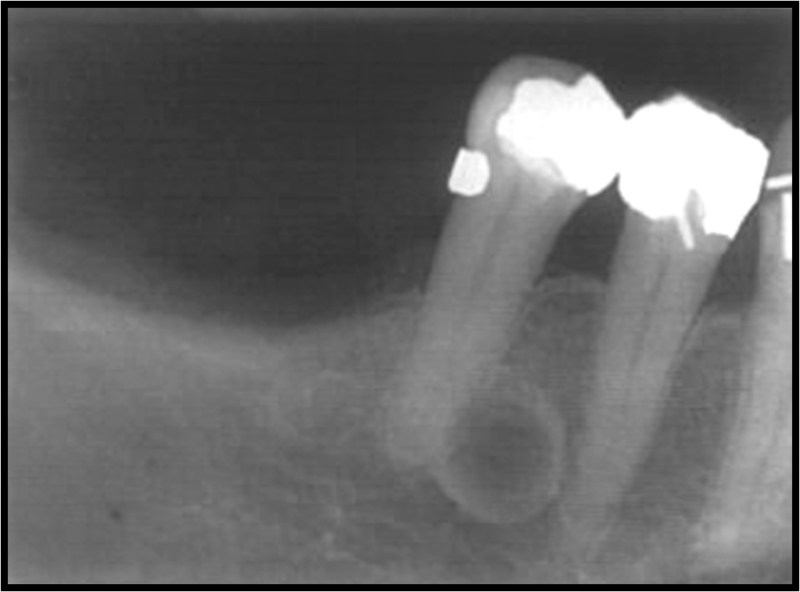 Superimposed over the image of the roots of the molar. The internal structure is radiolucent. If the cyst is large enough, it may displace and resorb the adjacent teeth and cause a considerable amount of smooth expansion of the buccal cortical plate. The fact that only a BBC tilts the molar as described helps to differentiate it from other lesions. An odontogenic keratocyst (OKC) is a non inflammatory odontogenic cyst that arises from the dental lamina. The second and third decades, male predominance. OKCs usually have no symptoms, although mild swelling may occur. The epicenter is located superior to the inferior alveolar nerve canal..
OKCs can displace and resorb teeth but to a slightly lesser degree than dentigerous cysts. The inferior alveolar nerve canal may be displaced. inferiorly. 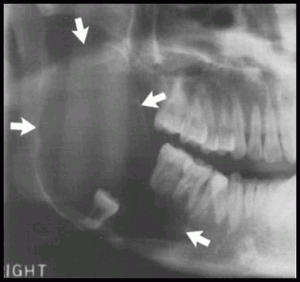 Intra­bony counterpart of the gingival cyst in the adult. Internal structure .The internal aspect usually is radiolucent. The botryoid variety has a multilocular appearance. A small OKC, small mental foramen, or small neurofibroma or a radicular cyst at the foramen of a lateral (accessory) pulp canal. Calcifying odontogenic cysts are uncommon, slow growing, benign lesions. Peaks at 10 to 19 years of age, with a mean age of 36 years. A second incidence peak occurs during the seventh decade. Equal distribution between the jaws. 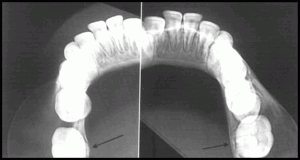 Most (75 %) occur anterior to the first molar, pericoronal radiolucency. Periphery and shape. The periphery can vary from well defined and corticated with a curved, cyst like shape to ill defined and irregular. Internal structure. The internal aspect can vary in appearance. It may be completely radiolucent; it may show evidence of small foci of calcified material that appear as white flecks; or it may show even larger, solid, amorphous masses . In rare cases the lesion may appear multilocular. Occasionally (20% to 50% of cases) the cyst is associated with a tooth (most commonly a cuspid) and impedes its eruption. Displacement of teeth and resorption of roots may occur. When no internal calcifications are evident and this lesion has a pericoronal position, it may be indistinguishable from a follicular cyst. Of the other lesions that may have a cyst shape and internal calcifications, the ameloblastic fibroodontoma resembles this lesion the most. This entry was posted in Oral Care, Oral Surgery and tagged Radiographic Appearance of Cysts on December 27, 2011 by meifong.